I have read tons of articles that say that if you really want to lose fat and get toned you need to weightlift – yes, even women! The heavier you lift the faster you will burn fat. I really wanted to find a workout routine that would give me a total body workout using free weights that wouldn’t require me to go to a gym. I think this is the one I am going to try out first. It looks like each of these sets would take around 30 minutes to complete. I am going to start tonight and let you know how it goes! 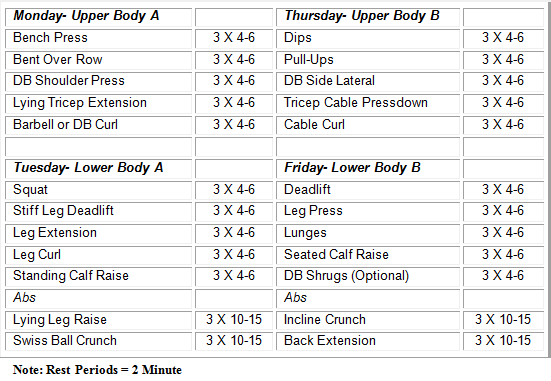 During weeks 1-4, you will be lifting in the 8-12 rep range. 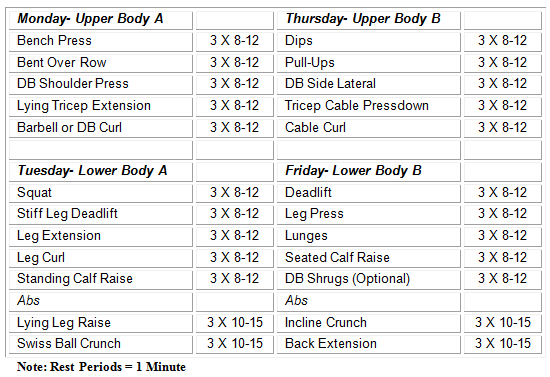 What this means is that you want to complete at least 8 reps but no more than 12 reps for each set. If you cannot complete 8 reps, then the weight is too heavy and you should decrease the load. If you can complete more than 12 reps, then the weight is too light and you should increase the load. During weeks 5-8, you will be lifting in the 6-8 rep range. 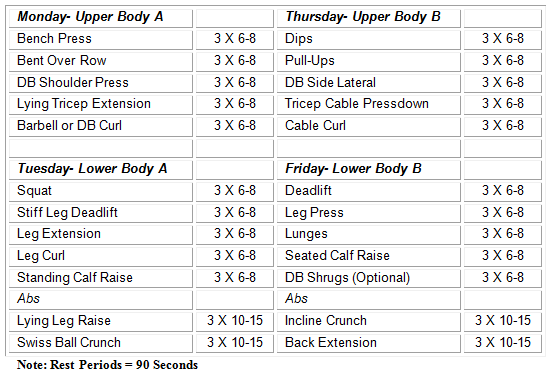 What this means is that you want to complete at least 6 reps but no more than 8 reps for each set. If you cannot complete 6 reps, then the weight is too heavy and you should decrease the load. If you can complete more than 8 reps, then the weight is too light and you should increase the load. During weeks 9-12, you will be lifting in the 4-6 rep range. What this means is that you want to complete at least 4 reps but no more than 6 reps for each set. If you cannot complete 4 reps, then the weight is too heavy and you should decrease the load. If you can complete more than 6 reps, then the weight is too light and you should increase the load. Exercise Tips: Form Over Ego! We cannot stress enough how important it is to maintain strict form on all movements. This means stabilizing your body and contracting your abs so you isolate the primary intended muscles. For example, when doing a standing barbell curl, tighten your abs and do not rock or swing the weight. By tightening your abs, you stabilize your body and prevent momentum. This will also help condition your abs and save your lower back from injury. You should perform 1-3 warm-ups sets before working a given muscle group. For example, I you are going to bench press 85 lbs for your work sets then do a warm-up set with 45 lbs (just the bar) and then a set with 65 lbs before trying to bench press 85 lbs. We recommend 60-120 seconds of rest periods between sets. This allows your body to recover some of its expended ATP but is not so long that you lose the flow of the workout. Remember, the goal is to get in and out of the weight room in 30-45 minutes. If you miss a workout, simply work your schedule so you get back on track. Do not skip a workout! You have three off days per week. If you miss Tuesday’s workout then try to do it on Wednesday and then get back on your normal schedule.